February 13, 2009 – Mount Pleasant, SC – Today Coastal Living, I’On Group and Structures Building Company celebrated the groundbreaking for the 2009 Idea Home on Jefferson Canal in I’On. Ten years ago, Coastal Living built its first Idea Home in I’On on Sowell Street. Now the prestigious lifestyle publication is coming back to the neighborhood to celebrate a decade of success. 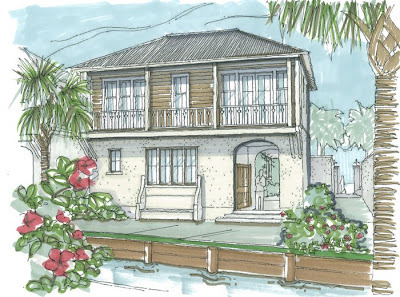 The home, located on a reserved property in the heart of the neighborhood, will feature Caribbean style architecture and a uniquely private courtyard. The home will be completed and open for tours in late July through mid-October. Tickets will be available for $10 on site and at I’On Realty. Proceeds from the tours will be donated to a local charitable organization. The furnished home will be offered for sale by I’On Realty and it will be the flagship home among 13 custom home offerings designed as the Courts at Jefferson Canal. A special section on the Idea Home will be featured in the October 2009 issue of Coastal Living. Structures Building Company is an award-winning custom builder specializing in high quality, green-built homes in the Charleston area. I’On Group, is a nationally recognized, award-winning new urban development group based in Mt. Pleasant, South Carolina. Coastal Living is a lifestyle magazine providing a definitive guide to comfort, simplicity and personal style. It is published by Southern Progress Corporation, a subsidiary of Time Inc.